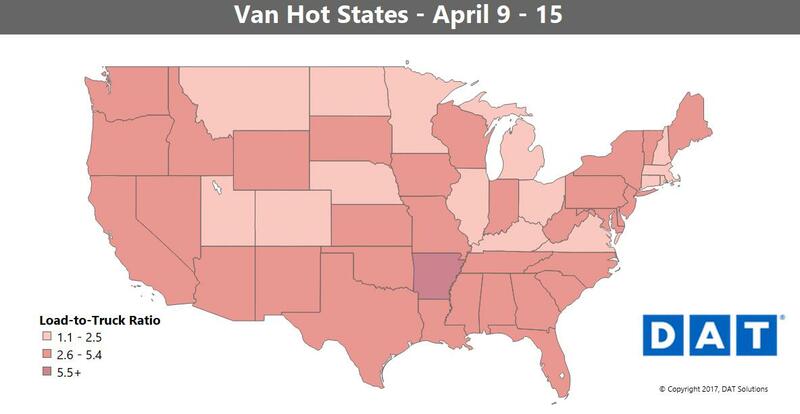 There have been positive signs for van freight in recent weeks. For one, reefer freight continued to pick up the pace last week. That should benefit vans going forward, since it'll keep reefer trucks from also competing for van loads. Plus, some of the produce that's driving reefer shipments can be hauled in a dry van. We usually see a dip in the number of loads available in the week before Easter. Most truckers want to get home for the weekend, and some are willing to take a lower rate than usual to get home in time for Easter. Some shippers also take Good Friday off. Still, the drop-off in load counts wasn’t nearly as steep as we’ve seen in past years, and in some key markets, volumes were actually up. The agricultural market in Fresno has picked up steam, which helped to lift van rates out of Stockton, CA. For volumes, Seattle, Dallas, and Chicago all had more loads last week when you’d usually have fewer. Buffalo and Columbus were down a bit last week. Both are jumping off points for freight going deeper into the Northeast, and the slowdown is normal for this time of year. As noted above, van rates were down on the backhaul lane from Houston to Chicago, but you can put together a TriHaul on that return trip to boost your revenue. There’s demand for vans in the Quincy, IL, market right now, which is in the western part of the state and includes part of Northeast Missouri. On Monday, the van load-to-truck ratio in the Quincy market was 7.9 loads per truck, compared to the national average of 3.2, and there are loads going there from Houston. Those paid $1.64/mile last week, and the price for van loads going from Quincy to Chicago has jumped up to $2.75/mile. Not counting deadhead, the TriHaul adds about 146 miles and boosts your average rate per loaded mile from $1.54 to $1.84. That’s an extra $923 in your pocket if you can make it work with your hours of service.